Save Money by Grooming Your Dog at Home. 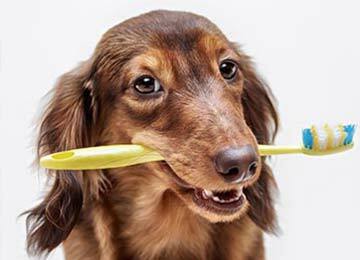 You really can groom your dog at home! With the right equipment and the right attitude, you’ll be able to groom your fur baby like a pro. Even if you do mess up, your pup surely won’t complain about their new ‘do! Shampoo: Oatmeal Shampoo is a great place to start. It’s perfect for all coats. For dogs with sensitive skin and for puppies, try their Hypoallergenic shampoo. 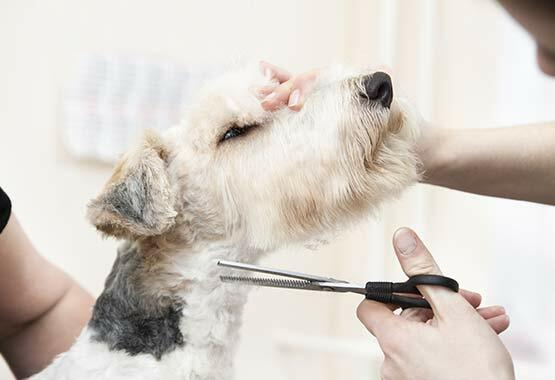 Shears or sharp scissors: No need to buy pet-specific shears here, just make sure they’re sharp so they don’t snag the fur! Make sure your pup is squeaky clean before beginning the haircut. Thoroughly dry and comb your furry friend. 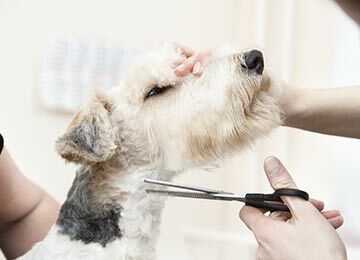 If your dog ‘s fur tends toward matting, pay particular attention to their coat before using the clippers. Using clippers on matted hair can be very painful for your pup. 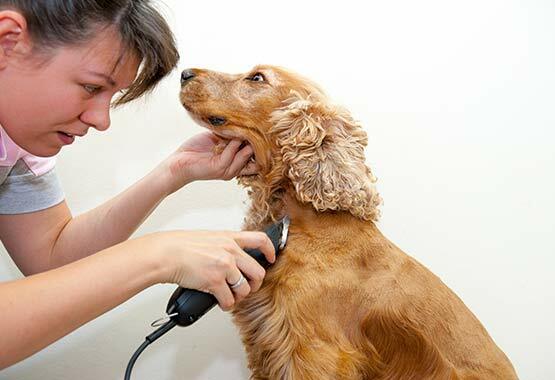 If your pet is matted use a de-matting comb to loosen the mats from the skin before beginning with clippers. Clear the space in your home where you’ll be clipping. Keep in mind, cur will get everywhere so be sure to clip fur where it will be easy to clean. Consider asking a friend help hold your dog (or alternatively using a leash and securely attached harness). This will ensure you have two hands available for grooming. Start from the neck and work your way down the body. Clip with the direction of the fur and make sure your dog is aware of where you are, at all times. You don’t want to startle your dog while you have clippers near their body. If your dog has matted hair, use a de-matting comb first to loosen the matts. Then try gently using the clippers on the lowest setting to start removing the matted fur. 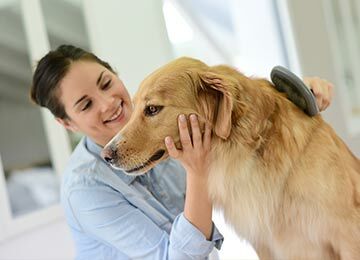 If you notice your dog experiencing pain during the matt removal, stop and consider talking to your veterinarian about administering a pet sedative and having the de-matting procedure done in their office. Now tend to any additional spots that need attention. This is where you’ll use sharp and blunt-tipped shears. Be extra careful around eyes, this is where you may want to use the blunt-tipped shears. If your furry friend has lots of hair in between their toes, you’ll want to hold on tightly with one hand. With the other, use a slicker brush starting from the front of their toes and brush towards the direction of their legs, against the pattern of natural fur growth. This will pull up extra hair. You can use shears to cut this excess from atop the comb. I’ve also seen groomers use clippers on the bottom of their dog’s feet – this is to get any extra hair in between their toes and pads. Step back and relax! Your job is done. Even if your clipping seems a bit uneven it will regrow soon enough so you can try again in a few weeks. The average length of time between grooming sessions is usually 6-8 weeks, depending on the type of coat your dog has. If, for example you have a golden retriever with long fur, you might want to do grooming sessions a bit more often during the summer! 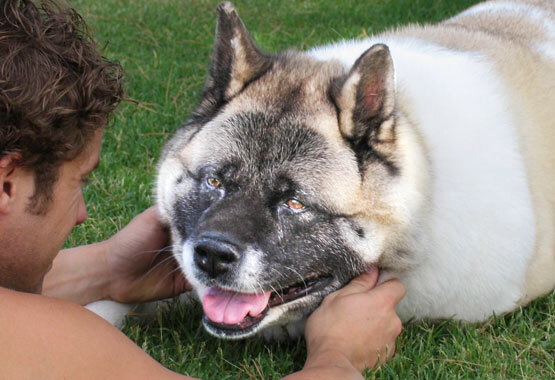 Another option is to clip the belly fur shorter so if your dog can rest their bare belly on the cool ground while still enjoying the protection of longer fun against the hot sun. 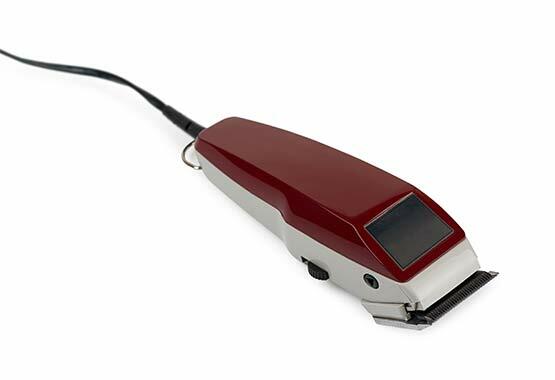 Make sure you oil your clippers after using them to keep them prepped for the next time! Brush off the extra hair with an old toothbrush each session, before oiling. Keep clippers sharp. 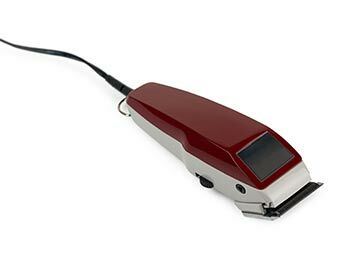 Most places that specialize in knife sharpening will also sharpen clipper blades as well. If they need to be sharpened, make sure to do this ahead of time instead of waiting until your pet’s hair snags. If the sound of the clippers makes your dog anxious, shop around for quieter ones. If those still make your dog jump, it might be best to look into a calming aid. I recommend this Anxiety Relief for Dogs Treats if your poochie needs a little help relaxing before grooming. Finally, have fun with it! You probably won’t get it exactly right the first few times, so be able to find the humor in a lopsided cut. It might even be wise to watch your groomer perform their magic before trying it on your own. Either way, your dog will love you the same and it will be wonderful bonding time for you both. Save Money by Grooming Your Dog at Home You really can groom your dog at home! With the right equipment and the right attitude, you’ll be able to groom your fur baby like a pro. Even if you do mess up, your pup surely won’t complain about their new ‘do! "I have a collie with an extremely sensitive stomach. About twice a month or so, he would find something out in the grass he's not suppose to get into, and he would end up having diarrhea for a couple days, sometimes a week. Since we started giving him this supplement, we've been squirt free for almost 3 months straight now. Highly recommend!!" "I have an 8 yr. Dachshund rescue, who was given up because he had back issues as a puppy. So, I take everything that goes in to his body very seriously. Other products were too potent, but Sidney has stabilized now since adding your formula to his diet. 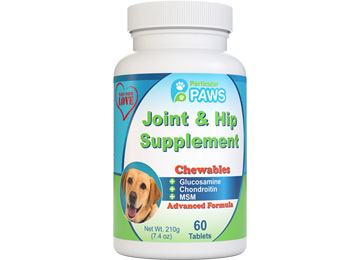 Since he is a dachshund, joint health is a priority for him and me. My Sid is now a changed dog and has been enjoying your Joint Supplement Powder mixed with his lunchtime snack of yogurt with a biscuit. Thank you Particular Paws!" "Don't get me wrong, I love my pit bull but there were times when I was at my wits end due to the anxiety that separation issues caused. Every time I would leave the house, my dog would act out and tear things up due to the anxiety that he felt. Buying a bottle of the Particular Paws dog calming aid was the best thing I could have done. 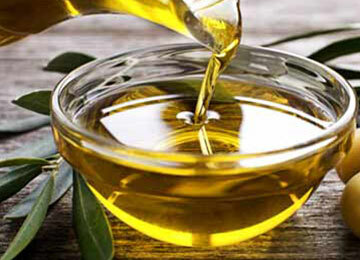 It was a night and day difference when introducing these pills into their diet." "This product really works! I have a Boston terrier and his poor baby eyes are always watery so they leave tear stains. I wanted something gentle because I definitely do not want to irritate his eyes even more. This product was great. It says you can use daily, but I use it every 3 or 4 days and it has helped him a lot and doesn't seem to bother him one bit. 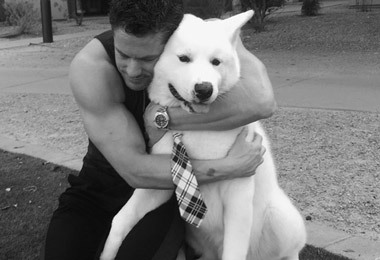 I would recommend to anyone with a dog with tearing eye problems."